The Cherenkov Telescope Array (CTA) is one of the major future facilities in the field of astroparticle physics and high-energy astrophysics, exploring the high-energy universe with gamma rays above 10 GeV. The CTA observatory will consist of more than 100 telescopes distributed over two sites, one on La Palma (Spain) and one in Paranal (Chile) and the telescopes on each site will be located up to several kilometers away from each other. The telescopes consist of tessellated mirrors which focus the few nanoseconds long Cherenkov light ashes from air showers initiated by cosmic gamma rays in the Earth’s atmosphere onto fast-recording, pixelated cameras. In order to properly combine the spatial and temporal information of these short light ashes from all the telescope cameras and accurately reconstruct the properties of the observed air shower, precise knowledge of the timing is mandatory for CTA. It is therefore required, that the relative timing precision between different cameras is better than two nanoseconds with less than one nanosecond jitter (RMS). In order to achieve such a high time precision, CTA will use a unified timing system which is based on a hierarchical White Rabbit Ethernet network . 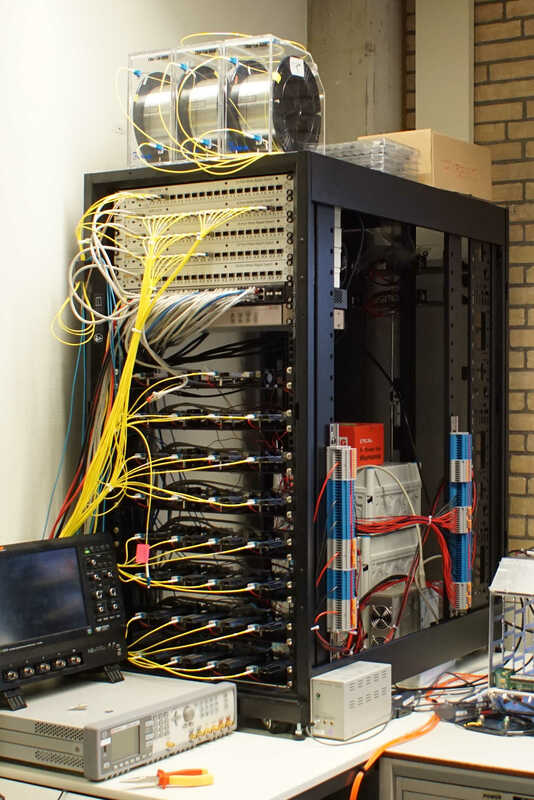 To verify that such a network fulfils the requirements, a mock setup of a Timing System similar to the final CTA Timing System has been built in the lab in Amsterdam (shown in Figure 1). It consists of a single White Rabbit Master Switch which is connected to an external GPS clock to provide absolute timing information. 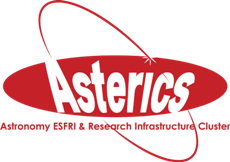 The master switch then distributes the reference time and frequency over a network of intermediate White Rabbit Switches via optical fibres to dedicated White Rabbit timing nodes which provide the interface between the Timing System and the telescope cameras in CTA. The White Rabbit timing nodes used here are the ZEN-CTA boards developed by Seven Solution which are based on the WR-ZEN board design  with additional time stamping capabilities dedicated for the use in CTA. After the successful commissioning of these ZEN-CTA boards, we used 32 of these timing boards for our Timing System lab setup. They are connected to three intermediate White Rabbit Switches with optical fibres of different lengths (up to 5km), mimicking a CTA array with 32 telescopes. In a first step, the whole Timing System has been calibrated following the relative calibration procedure applied currently in most White Rabbit Ethernet networks . 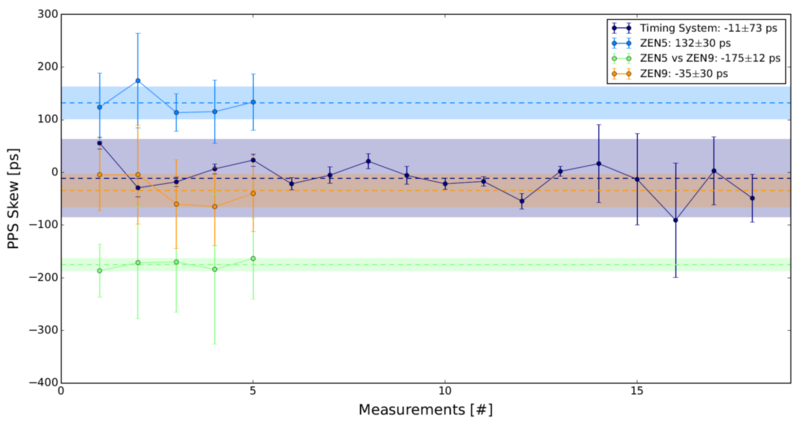 To ease the calibration measurements, a complete software package was developed including a user-friendly GUI interface shown in Figure 2. It allows us, in addition to making sure that the calibration values are obtained in a consistent way and verified, to keep track of these measurements and store the obtained values in a database for bookkeeping purposes. This enables easier maintenance of the Timing System when single components have to be replaced during the life time of CTA and can be used for verification and validation of the required timing precision and accuracy over time. After the complete calibration of the Timing System in the lab, verification measurements of each White Rabbit link have been performed. For this purpose, the ZEN-CTA board Zen5 was connected to the first intermediate White Rabbit Switch using a five kilometre long fibre and the ZEN-CTA board Zen9 was connected to the second intermediate switch using a four kilometre long fibre from a different vendor. The verification measurements of the PPS skew of the calibration of each White Rabbit link, i.e., the difference between the PPS signals seen between two devices after calibration, in this setup is shown in Figure 3. It can be clearly seen that the PPS skew measurements are well below the order of a few hundreds of picoseconds. Especially, the PPS skew between Zen5 and Zen9 which would be equivalent to the clock different of two telescopes connected via different intermediate switches is well around -175 ± 12 picoseconds and therefore well within all of the CTA requirements. While most of the calibration measurements described above can be performed before the full integration and installation on-site, the verification of these values over the life time of CTA, especially the measurements of the asymmetry of already deployed optical fibres, still bears logistical problems. We are therefore looking forward to the development of absolute calibration measurements, also to be able to exchange components linked to the Timing System between the CTA Northern and Southern arrays without the need for a recalibration, and the ongoing development of in-situ calibration measurements for quality assurance in the field. Figure 1. Timing System Setup in Amsterdam. It consists of several White Rabbit Switches from Seven Solutions (top panels in the rack), a copper ethernet switch, an Arbiter 1084B GPS, 32x ZEN-CTA boards (four in each of the lower panels of the rack) and several kilometers of single-mode optical fibers (e.g., on top of the rack). Image credit: Heike Prokoph. Figure 2. GUI interface for the developed White Rabbit Timing System Tools. 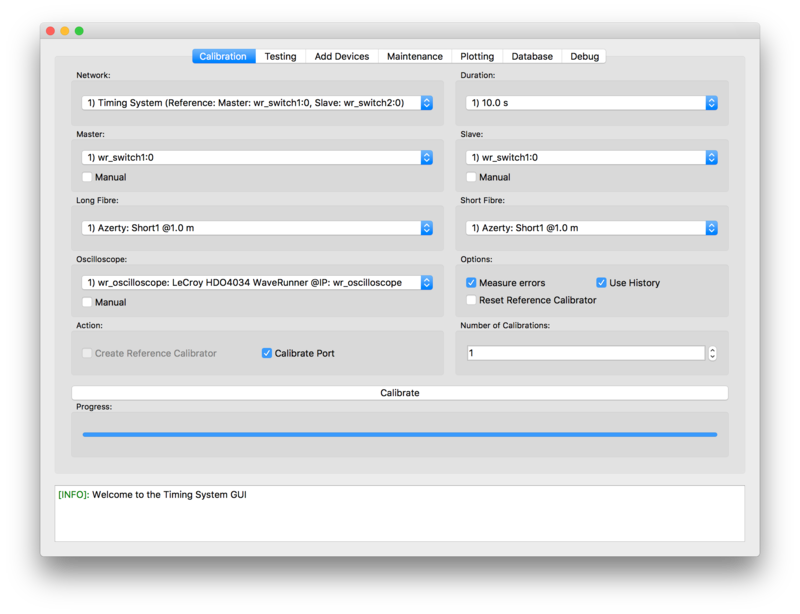 This is the default view when the GUI is opened, showing the Calibration tab used to calibrate a WR Link. Visible is also the main tab bar at the top and the logging window at the bottom. Image credit: Heike Prokoph. Figure 3. Shown is the verification PPS skew of the calibration of a mock CTA Timing System as well as the PPS skew between the GrandMaster switch and two White Rabbit Nodes called ZEN5 and ZEN9 as well as the PPS skew between the two Nodes themselves. Image credit: Heike Prokoph.